See below for specs and info about my Nor’Sea! When something stands in the way of your dreams, you remove the obstacle or find a way around it. In 2008 the obstacle was lack of a boat and a land-locked job. So, I left the job and purchased Daphne, whom I’m now convinced is by far the best liveaboard and coastal or offshore voyaging boat I could have chosen. I could prattle on and on and never find an end to the reasons why the Nor’Sea was a perfect choice for me. However, plans change and I cannot look back. Instead I must look forward and make headway toward the next horizon in my evolving dream. And so, I return to teaching as I prepare for my next voyage in life. At this point, Daphne will better fulfill someone else’s dreams than she will mine. Therefore, my Nor’Sea Daphne is for sale. Yes I am, without question, sad to be selling Daphne. I’ve had many great adventures aboard her, and wonder if my future plans will eventuate in something greater than another year sailing solo aboard Daphne. No doubt, if I continue to live restlessly in search of unusual and exciting experiences, then selling Daphne will not prevent me from accomplishing a life full of imagination that I desire. When I purchased Daphne, although used, she was in mint condition. Not even a scratch, and I made sure to keep her that way. I made many upgrades to her including a new sail, a full winter cover, a monitor wind vane, and solar power. 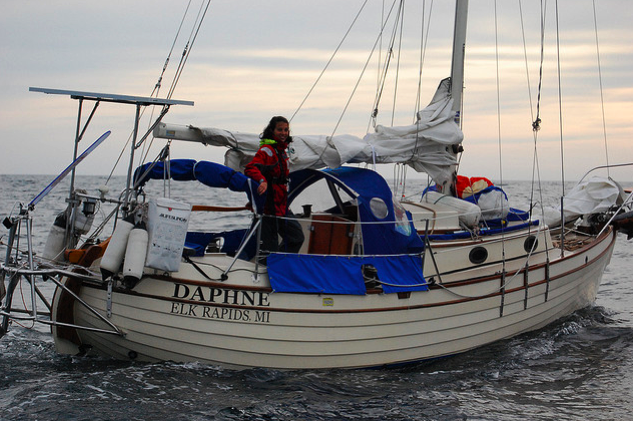 Now, fully ready to liveaboard or cross oceans, Daphne is awaiting her new owner. If you are interested, please email me directly rather than posting your interest in the comments. Following is a brief listing. There is always a flurry of fun on Facebook. Join the conversation! More Nor’sea Info at the Nor’Sea website. The aft-cabin is very comfortable for two people. I slept there often and loved that I could leave the hatch open and see the stars. I could also simply sit up to take a look all the way around the boat when I was underway or at anchor. The aft cabin also provides a comfortable backrest while sitting in the cockpit. I never realized how important this was until I sailed on a different boat. When you spend hours in a day, or many days in a row on a passage just sitting in the cockpit its important to be comfortable. The Nor’Sea is the only boat of its size to have an aft cabin, which provides a full backrest and a very comfortable cozy cockpit. Its also more cozy due to the cockpit being centralized and protected by forward and aft cabins therefore keeping the cockpit very dry. Daphne is a breeze to sail solo. She handles easily and all the lines lead to the cockpit. Daphne is beautiful. I often had visitors because of her beauty and they would claim that she was the prettiest boat in the anchorage. Daphne is trailerable, which mean that when I first purchased her I parked her in the backyard where I lived aboard for the first two months I owned her. Daphne was very comfortable to liveaboard. I lived aboard for several years and never felt uncomfortable. I had guests stay with me for just a few days up to a few weeks and as many as three other people. There was plenty of sleeping space for them all. I also enjoyed sleeping in the cockpit (which I have boards to use to convert it to a double berth) either under the stars, or under the bimini on a rainy night. I always felt safe in an anchorage. This is the truth. This is due to the anchors that I have equipped Daphne with and the length of chain. I’ve seen some wicked wind at anchorage. In one particular gale I watched four boats drag across the anchorage while Daphne didn’t move an inch. It surely helped me sleep at night. I had ample power and never felt like I was “roughing it.” Before I installed the solar panel on Daphne I did not use any electricity. That felt more like camping, but I still loved it. In fact, I thought twice before installing the solar panel, but am sure glad I did. The solar panel has provided enough power for me to power the refrigerator, computer, navigation electronics, and charge camera batteries, and even a curling iron. I never worried about power consumption and was happy that it was free and clean and renewable. Daphne comes with a full winter cover that was deigned for the Nor’Sea. I lived under this cover during one snowy winter in Massachusetts. I totally felt cozy in my boat and the kerosene heater is enough to heat the small cabin. The Nor’Sea 27: A Unique Bluewater Pocket-cruiser. The Nor’Sea 27 is a small but rugged pocket-cruiser with live-aboard comfort and seaworthiness at the heart of her design. Designed as a heavy weather, long distance cruiser that was still legally trailerable. According to designer Lyle Hess “any boat that points her bow out to sea should be designed so that the crew need not worry about a safe return–no matter what tricks the weather may play”. This is the theme paramount to his designs. Nor’Sea: 4 circumnavigations and more than 160 Pacific and Atlantic crossings under her hull. Since its introduction in 1977, the little cruiser has gained a cult following. In total around 450 have been built and production continues to the present day. The Nor’Sea 27 is a heavily-rigged sloop. Double-ended profile with a wide curvy canoe stern accentuated by the upward sweep of the lapstrakes and a sweet, springy sheerline. Below the waterline: a full keel with forefoot cutaway that is fast and modern. Nor’Sea Yachts maintain a “super heavy duty” philosophy in construction. The hull is of solid hand-laid one piece laminate with up to 22 layers of mat and woven roving, and molded in lapstrakes which provides extra stiffness and strength as well as traditional looks and a drier boat. Interior plywood bulkheads and a partial molded fiberglass liner provide further structural reinforcement resulting in an extremely strong hull. The plywood-cored deck is fixed to an inward flange with adhesive sealant and stainless steel bolts spaced at 6-inch intervals. Deck fittings and hardware are oversized and through-bolted to stainless steel backing plates. This build quality gives the Nor’Sea 27 the strength of a larger boat. The Nor’Sea 27 has held their values well and have remained highly sought after so tend not to linger long on the used boat market. The biggest problem has been in early models of the Nor’Sea with corrosion in the aluminum fuel tank, which is buried in the keel directly under the engine. It needs to be fully glassed over to protect it, or excavated and replaced if already corroded. Its good to know that this problem was alleviated in later models, and Daphne’s fuel tank is appropriately glass over and has had no problems. Most Nor’Seas on the market do not come with a trailer. Having a trailer increases the value of the boat as the trailer required is specialized (designed and constructed for the Nor’Sea) and can cost up to $12,000 new. The Nor’sea has two modes: aft-cabin and aft-cockpit. Daphne is an aft-cabin model and is the main reason she was so appealing to me. The aft-cabin model is preferred 9:1. Consider storage of your boat when your not using it. Will it stay in a marina? At a boatyard? Nor’Seas are trailerable so you can easily change locations, or store it in your back yard. And you can do all the work yourself in a day! You can take the mast down and trailer her yourself. I did it, with only one person helping me. Daphne comes with a DVD that explains how to step the mast. The custom made winter cover that Daphne comes with is unique. Most boats do not come with this and therefore owners spend a lot of money on shrink-wrap during the winter months. Awesome canvas gear hammock in aft cabin. Winter (or summer) canvas cover. Its huge, covers the entire boat, including the mast! 140% drifter, multi color + beautiful! built for sling or ramp launch. Daphne was always launched from a sling so I never submerged the trailer in salt water. I will put on my (low power) prediction hat and say that you and Ben will be in the market for something good for 2 or more. I look forward to seeing what else comes up in the near future. I know that the decision to sell either boat was not easy. Keep us up with what you are up to now. Best wishes and smooth sailing ahead to you and yours. Douglas! Everyone is making predictions and I wish I could spill the details, but I don’t even know them yet. And Daphne is totally good for 2+kitty cat. It will be very hard to sell Daphne. I’m already sad about it. I know how you feel. I am selling my Caraway after thousands of miles cruising in her. We’ve been through a lot together and it’s been nearly ten years of adventures. I’m selling her because of the absurd costs of keeping a boat in the UK, the vandalism by thieves and the persistent accidental damage from other boat owners. Oh and also the fact that wherever I seem to go the sea is ruined by power boats and idiots on jet skis. I will buy a cruising dinghy and go up shallow creeks where nobody else goes and then charter or crew when I need a proper ocean fix. Daphne is a beautiful boat, so well loved and looked after. I’m sure it’s sad for you to give her up, as it is for Ben to sell Elizabeth, but it also sounds like the next adventure in your lives contains excitement and love. I wish I had the money to purchase Daphne, as I can see she’s just gorgeous, and a great sailing vessel, but I just bought my new home, a 30′ Islander. Both boats will find caring, loving owners, and you’ll make your new ship a wonderful home! I look forward to reading more about your sailing adventures. New life chapters are always a little scary and nerve-wracking, but that’s what makes them worth living. Good luck, Teresa! Best of luck to you in your new adventures. Being willing to make a change and venture into the unknown is what makes life exciting! Please inform on the year of make of the boatband the asking price? Thanks for your frank answer. Much excitement in your new adventures! Love the youtube vids. Doing the same thing in a few years. I have a power boat right now but changing to sail. The power boat was nice ( I put in over by Tawas Mi. ) stayed on it all summer and loved it., but fuel is going up and sailing is more fun. Looking forward to more vids, later. Came across your site while checking on the Nor’sea 27s and other small boats on the market. Enjoyed your videos and commentaries. Lost my well loved, well cruised, Flicka in a storm off Bahia Honda Key (insurance total) last March, and have started a slow (unhurried) search for my next boat. The Nor’sea 27 is on the short list of possibles. Please send the listing info including your asking price to my email. Good luck with your future plans. Hi Theresa. I love your boat and your Blog. However we are literally oceans apart so it is difficult for me to come to see ‘Daphne’ but I am interested all the same to know your asking price. E-mail me please. Good luck. PS. I had a Hunter Medina 20 three years ago which I had to sell.so I know all about being in love with your boat and having to part with it. I am sorry, I have been busy for the past while, falling in love and beginning a new life…… i see Daphne is in the hands of a new adventurer. i wish her strong winds and fair seas. I hope to be in Anguilla by Dec 15th for 10 weeks aboard my boat….. Will you and Ben be in the neighbourhood? If so, drop a note and lets tear up some laughs. Oh…. i forgot to say, my sister lived in Mowat’s cottage on the shore of Barcovan Beach in 1978….. Unfortunately we aren’t going that far south this winter. Take some pics and go snorkeling for us!! Very nice post.Can you tell me the price please. Daphne is sold. However, please check the links at the top of this post for other great boats for sale. They are all Lyle Hess designs, like Daphne. Some Nor’seas, and a Bristol Channel Cutter. Good luck with your boat search. Your blog is very encouraging. I, too, hope to retire on a sailboat someday. Keep up the good work on your blog. You’re definitely living the adventurouis life. Godspeed and Following Seas. Hi, Ran across your blog and vid’s accidentally…and loved them. Wish you had more. Sorry to see you sold the boat as I was hoping you’d be sailing more and producing more videos. But nothing stays the same. I sincerely wish you the best in your furture adventures (and also hope they are aboard another sailboat!). I’m presently on my Cape Dory 25 sloop in Guaymas, Sonora, Mexico waiting to finish up a few last minute items before casting off for Baja, then to La Paz, over to Mazatlan and eventually to Puerto Villarta. . .
Love your smile! Best wishes….. Thanks, Dana! Good luck on your adventures as well. I am aboard another boat. I’m living on SV Elizabeth, a 28ft Bristol Channel Cutter. ….sleepless in landlocked Tennessee, I fell across you on You Tube while I was looking at “Tiny Houses”…..I have dreamed on living on a boat~ a bit bigger than your beauty but needless to say ~ continue to search my soul to answer…”Where is Home”. I just got a lead on a Nor’sea 27 that had been demasted and has no engine for $1000. I’m pretty tempted even though I already have a boat. It has been stripped of winches etc, but seems like I could fix her up. What do you think? Howdy, I’m new at sailing and was wondering how come water gets into the bildge? Do all pocket sailboats leak? I’m 6’3″ 287lbs and was thinking I may need a bigger boat? I live in a 17 ft travel trailer and have been called a Rubber Tramp, is live on life about the same as RVing? Can one live cheaper if one leaves the USA? I was thinking of sailing off to central america and living close to shore on the hook, eating fish and local fresh fruit mostly? Do I need a passport for this way of life? Don’t know if anyone still looks at this website, but we had a Bristol Channel Cutter “Getta-Wae Dhow” for @ 25 years and just sold it. We are in our 70’s now and still like to sail, so are looking for a Nor’Sea 27 with less maintenance and still a sturdy boat. Let us know if someone out there is able to part with their Nor’Sea 27. Thanks!